In the latest from Fantasy Mosaics, Penguin Penny was working on bringing us new and secret colors when she got stuck within a time portal! Help her find a key to the portal by solving new mosaic puzzles with a fun new twist - unlock secret colors hidden in each puzzle! Explore the time portal and see If you can help Penny. 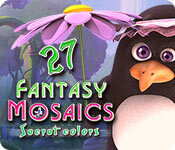 Fantasy Mosaics 27: Secret Colors is rated 3.7 out of 5 by 18. Rated 5 out of 5 by pedz69 from Fantasy Mosaics 27 - The genre just gets better Like a lot of reviewers I find this developer has really mastered the nonogram/ gridlers technique. As such I have found myself buying quite a lot of these and clearly, having now 28 editions available sort of speaks for itself. Unlike other games in this genre , the secret is quality and consistency. Whilst other developers tend to go for weird layouts, strange shapes and double hit boxes they have often lost the plot on making their games solvable by logic. Not so Fantasy Mosaics, who remain subtle in their improvements the latest being secret colours that are only visible when progress is adequately made. Well done the penguins. Rated 5 out of 5 by serv01 from Great but I would want more... So great gane. I would want 25x25 or even 30x30 board. Posibility to set harder level, for example when found all full squares in line, empty ones do not automatically fill up. Rated 5 out of 5 by SrRat from DIDN'T THINK IT COULD GET BETTER! But it did! The pictures are wonderfully colorful and gestural. Having a choice of hue and texture in the tiles is fun but having the choice of color locked based on play is brilliant! Just finished the first set of pics. Loved every one of them. I love this series. I have every one. As long as the developers come up with adventures for the penguin family, I'm going along on the ride. Rated 5 out of 5 by equi_1 from Brand new feature! I'm addicted to Fantasy Mosaics! And I really like the idea of blocked colors. It makes the game more challenging! Rated 5 out of 5 by ColoNative from Another Great One in the Series The new game has a new twist (unlocking colors) that makes it fun, interesting, and a little more challenging. The puzzles seem to be more challenging as well but logical thinking will always help. Rated 5 out of 5 by memphis836 from Another Winner This series just keeps improving on an already great game. This mosaics series is the most fun and the most colorful. This time, something new has been added. You have to complete a color to open (unlock) other colors needed to complete the game. The game developers have also added a choice in square shades that is interesting. A bit more challenge for these games is a good thing and I always look forward to the next in the series. Well done! Rated 5 out of 5 by MrsBen from FANTASY MOSAICS 27 IS UTTER PERFECTION!!! These devs astound me! After publishing 27 games, they still have new features for us...They are listening to us! New tiles to suit your taste, a new storyline for our little Penguin friends to share with us and the detail of the pictures is amazing!! The way they hold back the colors fits the way I play, so that didn't affect me. All I can say is, YOU SHOULD HAVE WON AN OSCAR for your ability to keep us happy and entertained. Thanks to each and every one who has a hand in these games and to Big Fish Games for knowing what's really outstanding!!!! Rated 5 out of 5 by 2020moonlanding from Fantasy Mosaics with more challenges! 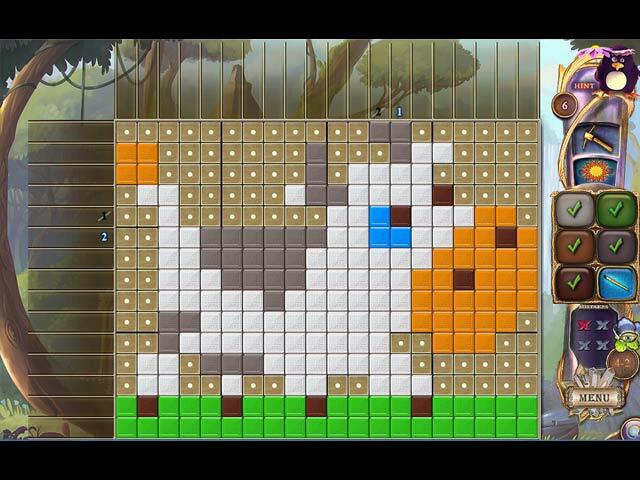 The next installment of Fantasy Mosaics is finally here with updated gameplay. There are more challenges in this edition that are new and unique to this series. Not all colors are available when you first start the picture which makes for more of a challenge where logic and symmetry are very important in advancing. You have tile styles to choose from, trophies to achieve, and collectibles to accumulate. This is a great game and I'm glad this developer has added a lot of new features to make for a great experience. Rated 5 out of 5 by grandmacathy from Now another little twist! I really love these games! I look forward to finding the little penguin and what antics he's up to now. In this game, there are the normal grids to fill in, and the multiple colors to make the resulting picture interesting (and recognizable). 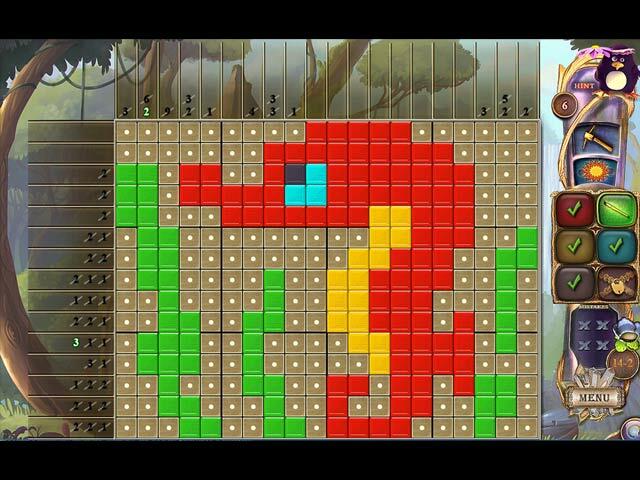 Like all good griddler games, finding the colored squares requires logic. The added feature in this game is how to open all the colors! There are locks on every color over the initial 1 or 2. The only way to open the locks on these colors is to find the first ones. So it was a little confusing when I started a grid and found locks on most of the colors. Where did that come from? I found out how to remove the locks quickly. Even though logic rules, you don't have the benefit of all the other colors to switch to at first. It makes you think a little harder. You have to love this developer. Griddler games have become more and more popular, yet they find a way to make each subsequent game more interesting than the previous ones, and better than a good portion of the griddler games out there. The only ones I really like better are the Arizona Rose ones that have been out for a while. On the whole, this game won't let you down. A real enjoyment! Rated 5 out of 5 by sunnyglow from COUSIN PENNY MAY BE STUCK IN A TIME – BUT THIS GAME IS NOT! OVERVIEW: In her search for new colors, Cousin Penny Penguin entered a time portal and now she is stuck. You will need to find the key to release her by playing all these wonderful puzzles. Penny Penguin may be stuck in time, but this game is not! This game has some new twists! You must unlock the colors one-at-a-time. You will no longer be able to switch from color-to-color at the beginning of the game. You must play into the game to release those colors. This makes this game a little more difficult! You also have a choice of five (5) different styles of tiles to fill in the boxes for the game. This feature is is another welcome plus! What a wonderful Monday surprise! A BIG THANK you to BFG for offering a game in one of my favorite genres. Match Gems has upped their game with these new additions! This is another excellent 5-star game from Match Gems. GAME FACTS: • Levels: Casual and Advanced. • Colors: The game has up to six colored screens. In this game you will need to play one color until you have uncovered enough of the cells to release the next color. • You have the choice of five (5) different styles of tiles • Autofill: There is autofill so you do not have to fill in the unused boxes. However, you can use your mouse to right click “X’s” for unused spaces. • Hints: Hints are given as you proceed and are based on the difficulty of the puzzle and how well you perform in solving the grid • Number of Levels and Puzzles: There are 100 puzzles – 20 levels with 5 puzzles per level in the game. • Aids: You have a pickax as an aid in the game • Awards: There are 3 trophies: a gold trophy for no mistakes, a silver trophy for 1 mistake, and a bronze trophy for two mistakes. If you make 3 mistakes, you must start the game over again. • Collectibles. When you complete one level of 5 puzzles, you receive a collectible. 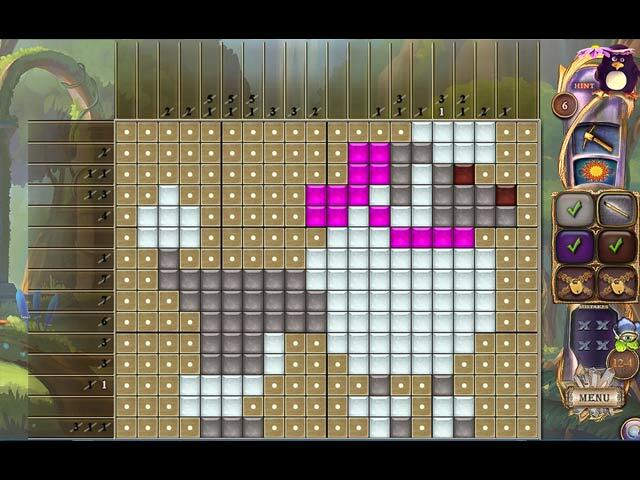 I highly recommend this game if you like Sudoku games or any type of mathematical puzzle.